Although Silva is unaware of the European actions at first, he's all too aware of the cupidity and narcissism of his boss, Director Nelson Sampaio. And Sampaio, newly converted to ostentatious Christianity for highly political reasons, wants Silva to solve a kidnapping. A dubious kidnapping at that, where the "victim" has run away before ... and one taking place in Brazil's northeastern region, where just saying that someone lives in Manaus is enough to condemn the person as corrupt until further evidence arises. It's not a normal job for the federal police, as Silva quickly asserts. However, Sampaio figures it's one way to protect and advance his budget. The victim's uncle holds massive power in Brasilia; Sampaio needs the man's vote. Silva was studying the scrollwork around that one when his boss began to speak. "You know I don't hold with people who apply political pressure for personal objectives, or to obtain favorable treatment," he said. Silva didn't know any such thing. He regarded the statement as an outright lie. "But this time," Sampaio continued, "I'll have to make an exception. Not for me, of course, but for the good of the department. ..."
Ironically, Mario Silva's nephew, Hector Costa, is attending a drug enforcement conference in Amsterdam when the police there discover they have an international crime on their hands, rooted in Brazil and responding via the Internet to twisted desires around the globe. Globalism never looked so bad ... especially when Hector and his team realize the criminal mind behind the operation may well be a woman who eluded the Chief Inspector in an earlier grotesque operation. 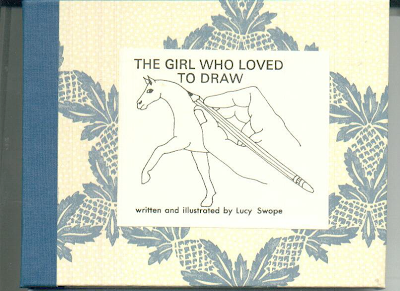 In classic Gage style, the chapters of investigation alternate with graphic descriptions of what's happening to the kidnapped girl. Yes, she really was kidnapped this time, and her insistence that she has powerful relatives isn't doing any good. Threats multiply, and as Mario Silva and Hector race to cut through the self-centeredness of the Manaus police leaders in time to reach their criminal, before she has wind of their investigation, young Marta Malan is barely holding her own. The clock's ticking faster and the threats are in her face. Literally. Gage excels in painting the portraits of evil. It's not just violence and murder that qualify; it's also seeing one's career as worth any sacrifice and discounting the value of others. How can one small fragment of a federal police department dodge the endemic corruption around it? At what point will Silva himself find evil seeping into his views and actions? His deliberate positioning of an arrested criminal in a jail cell with active rapists suggests he's more and more willing to "do whatever it takes" to get confessions, capture sadistic criminals, rescue those he sees as the real victims. DYING GASP was scheduled for January 2010 release, but Gage and Soho Crime brought it out early this month, a good thing for readers of this compelling series. The fourth Silva investigation, EVERY BITTER THING, is now scheduled for December 2010. And meanwhile, earlier volumes (BLOOD OF THE WICKED; BURIED STRANGERS) are available in softcover as well. Keep up with Gage's tour at his web site, www.LeightonGage.com -- and join him, and Kingdom Books, in celebrating the announcement that BURIED STRANGERS made the Deadly Pleasures list of the best mystery/crime novels of 2009. Now that's a happy way to wrap up the year. Not only does the Globe and Mail this week salute Archer Mayor's new book THE PRICE OF MALICE, but there's high praise for the entire series. Way to win 'em, Joe Gunther! 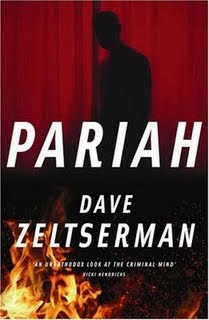 Yes, I'm working on a full review -- but for now, join author Dave Zeltserman in celebrating his second year in a row of landing on a Washington Post "Best Books" list! (Pick the tab for "Fiction" and scroll down to "Mysteries.") This time it's for PARIAH; last year, of course, SMALL CRIMES. Got a moment? Stop in at Dave Z's blog and toast the occasion. I'll be making a lot more noise about this, later in 2010 (can you believe we're almost to the start of the new year?). 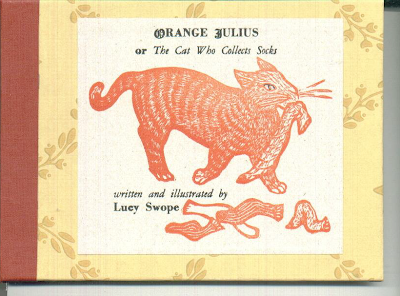 But right now, I want to post some images of a few of the covers of Lucy Swope's books, created at her Lucky Dog Press in West Fairlee, Vermont. Nope, they're not mysteries -- but they are filled with the spirit of hope and love that lights this part of our year especially. Full review soon. Check in next week. Wow, what a read! I AM PLEASED AND HONORED TO INVITE ALL OF YOU TO THE PRESENTATIONS/READINGS OF MY BILINGUAL ANTHOLOGY "DIFFICULT BEAUTY" IN THE BOSTON AREA, AS PER THE ATTACHED DETAILS. I WOULD APPRECIATE YOUR HELP IN SPREADING THE WORD. THANK YOU FOR YOUR PARTICIPATION AND SUPPORT! GRACIAS Y ESPERO VERLOS NUEVAMENTE EN ALGUNO DE ESTOS EVENTOS. 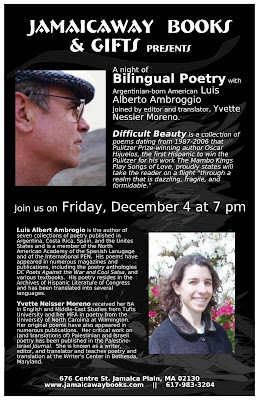 A bilingual poetry reading: Argentine poet Luis Alberto Ambroggio and translator Yvette Neisser Moreno read from Difficult Beauty. Grolier Poetry Bookshop presents: Russian poet Aleksey Dayen and Argentine poet Luis Alberto Ambroggio reading from new books, accompanied by Spanish translator Yvette Neisser Moreno. From Lea Banks comes this reminder that this Thursday, Dec. 3rd at 7:00 PM Mary Koncel and Kate Greenstreet will be reading from their work. 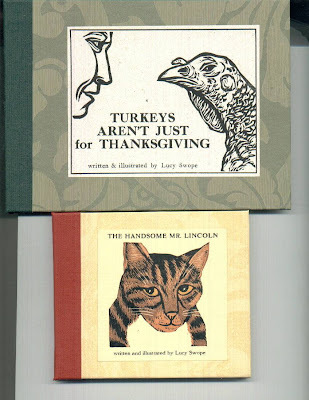 $2-$5 sliding scale. Mocha Maya's Coffee House, 47 Bridge Street, Shelburne Falls, MA, 01370. Weelchair accessible. See www.collectedpoets.com for more information.